See this is what I love about deviantART.com. As you trawl through the mass of talented people, you come across one whose abilities literally smack you in the face. You think "Why isn't this guy working for someone?" You read that he already is - you feel an idiot - then you quickly scour the net for more of his work, becoming more and more of a fan with every click. 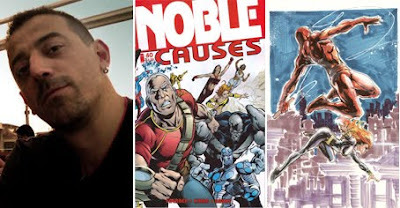 That guy for me is Yildiray Cinar. You might have already caught the mad skills of this Turkish artist on Nobel Causes, Dynamo5, or more recently on the Ravager Co-Feature in the pages of Teen Titans, but if you haven't checked out his gallery of sketches (on either his Blog or at DA.com) then you need to flick over soon - just be prepared for your jaw to drop okay? Showing off some serious steampower, the respective galleries, filled with Yildiray's bold powerful imagery, look more like promotional sketches for upcoming releases, than a couple of creative outlets for a sketch-happy artist. 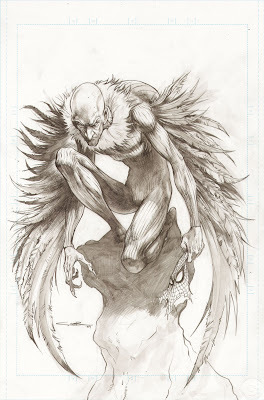 Case in point, take the below sketch of Spider-Man's nemesis The Vulture. Written off by many as one of the weakest Spider-Rouges, Cinar's sketch nails his sinister predatory nature, like few others have managed to do in the characters 40+ years of history. 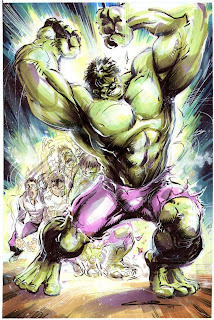 Better yet he uses the Steve Ditko 'never been beaten' costume design to do it with! There's no doubt about it, this guy is now on my 'to watch' list from here on in. For more info visit yildiraycinar.net.